Top 5 best computer certifications for starting a career in the IT industry. Becoming an Information Technology specialist is a rewarding career choice, the IT industry has a vast array of specialties to choose from and there are a ton of resources available to help you break into this exciting industry. PC technicians, network technicians, system administrators, data base administrators, Cisco specialists, VMware specialists, and network security specialists are but a few of the massive opportunities available. The technology industry is ever advancing too so newer opportunities are opening up as new technologies emerge and the demand for skilled technology specialists will continue to follow suit. Many of you who are new to the world of computers will probably start out as a PC technician and then ultimately you will work yourself up the ladder into a more advanced specialty. My own personal journeys into the computer world actually began in PC sales where I sold computers in a retail store. That experience ultimately opened the door to becoming a PC repair technician and then bigger and better opportunities arose again from there. To kick start your own journey into an exciting technology career there is no better way to do so than to get certified. Whether you want to eventually become a Windows System Administrator, Network Engineer or Network Security Specialist, an entry-level certification is a fantastic starting point. These days there are a slew of entry-level certifications to choose from and many are actually fairly easy to get so you may just be a shy step away from starting an exciting career. Here is a list of the top 5 best computer certifications to help kick start your journey into the computing industry. CompTIA's A+ certification is one of the best computer certifications for entry level IT folks. The A+ certification is not only a great foundation for starting a career as a PC Technician or Desktop Support Technician but it also sets the framework for your entire technology career. Once you are A+ certified you possess basic technical competence in areas such as installation, preventative maintenance, networking, security and troubleshooting. As a CompTIA A+ certified technician you also will possess the customer service and communication skills to work successfully with clients. This is a big plus for it shows employers that you have a versed skill set. One of the great things with the A+ and other CompTIA certifications are that they are vendor-neutral. Vendor-neutral is fantastic because the focus of the certification is broad so it touches more of the industry instead of single focus area. I started my own career with the A+ Certification and at that time employers requested that all PC Technicians were A+ Certified. And this goes for many IT jobs today for the A+ Certification is often a prerequisite for PC Technician and Desktop Support Technician jobs. And even if it isn't a requirement, if for example your skill set and experience matches another candidate but you are A+ certified and they are not, there is a good chance you will get the job over the other candidate. Passing the A+ Certification is pretty easy if you have a little experience in computers, though you will definitely want to get a good A+ study guide/book and take as many sample tests as you can. If you are completely new to computers or you've been out of the loop it won't hurt to take an A+/PC Technicians course in addition to a good study guide. Overall the CompTIA A+ is one of the best computer certifications for entry-level Information Technology individuals, and I highly recommend you get one if you are interested in becoming a computer support technician, or are just starting a career in any IT position for that matter being that it is a great foundation to build upon. Obtaining one of Microsoft's many certifications is a fantastic idea to complement a CompTIA's A+ or other IT certification. And one of Microsoft's best computer certifications for entry-level IT folks is the Microsoft Certified Desktop Support Technician (MCDST) certification. Being MCDST certified is the equivalent to having six to twelve months of experience in supporting end users of a desktop operating system. And since 80+ percent of the world’s computers run a Microsoft operating system, the MCDST certification is an invaluable addition to your skill set since it will prove that you are familiar with Microsoft operating systems and their core software. Being MCDST certified proves that you can successfully troubleshoot desktop environments that run on the Windows operating system. It also shows that you have the necessary soft skills to educate users and help them solve hardware and software operation and application problems on Windows. MCDST is perfect for desktop support and PC technicians since it covers Microsoft operating systems and Microsoft core software such as Microsoft Office. MCDST is different from the A+ certification in that it focuses on Microsoft operating systems and software solely but it does cover some of the same topics you may encounter in the A+. Like the A+ Certification, MCDST is also reasonably easy to obtain, especially if you have prior experience in a desktop support role. Though like other certifications you will definitely want to pick up a good MCDST book to fine tune your skills. Also have a PC handy that you can use for testing since it is best to apply what you read since a lot of MCDST is about remembering steps to perform a certain action. If you are totally new to IT, you should obtain your A+ certification first before working on the MCDST since the A+ transitions well to the MCDST. New IT folks should also take a entry-level computer course for it will help with obtaining the MCDST Certification. Overall the Microsoft Certified Desktop Support Technician certification is one of the best computer certifications for breaking into the IT industry, and it is a great computer certification to obtain to prove your competency with Microsoft operating systems and software. The Network+ Certification from CompTIA is another one of the best computer certifications available for entry-level Information Technology specialists. If you want to become an IT support person the Network+ is a must have certification. Network+ is a great complement to the A+ certification since it goes above and beyond the basic networking skills touched upon in the A+. Once you are Network+ certified you will be competent in managing, maintaining, troubleshooting, installing and configuring a basic network infrastructure. The Network+ is a bit more advanced than the A+ certification and it will take more preparation to pass, though there are plenty of solid books and training courses available to help you prepare for the Network+ too. Like the other top 5 best computer certifications I also recommend you take as many Network+ sample tests that you can for it will help you substantially during the real test. Keep in mind though that like the A+, the Network+ is also considered entry-level so you’re not exactly going to need a degree in computer science to pass the test, but CompTIA does however recommend that you get the A+ certification before the Network+ and additionally have at least nine months of experience in network support or administration or academic training. I’d have to agree that you should definitely get the A+ first since it provides a solid foundation for the Network+, is easier to pass than the Network+, and it will also boost your confidence in the process, though if you are reasonably experienced in computers you can forgo having the 9 months of professional networking experience that CompTIA recommends. A good study book, practice tests, determination, and your existing computer experience should be enough to pass the Network+. On the other hand the Network+ is not exactly for folks totally new to computers even though it is an entry-level certification. Information Technology newbies will definitely want to get the A+ Certification first and then gain some real world computer experience before setting their goals on the Network+. I don't think 9 months of network support or administration is required at all, though the A+ and some real world IT experience is a must. Overall the CompTIA Network+ certification is one of the best computer certifications for entry-level Information Technology specialists. It builds upon the A+ Certification by diving deeper into computer networking, a skill you will definitely need for a real word IT job. The CompTIA Security+ Certification is one of the best computer certifications for anyone looking to pursue a career in the field of network security. Network security is actually one of the fastest growing fields in IT. Once CompTIA Security+ certified you will be able to prove competency in system security, network infrastructure, access control, and organization security. Security+ is a great next step from your Network+ certification for it builds upon networking by focusing on core security aspects. Since computer security threats are always increasing in number and severity, there is a high demand for IT security specialists, and if you do get versed in networking and networking security you are going to be a valuable asset to any company. The Security+ Certification is more challenging then the Network+ so you will definitely want to make sure you approach the certification with networking experience already under your belt. CompTIA recommends you get the Network+ certification first and that you also have two years of technical networking experience with an emphasis on security prior to working for the Security+. I would have to just about agree with CompTIA's recommendations, for without a background in networking you are definitely going to be in way over your head. CompTIA's recommendation to get the Network+ first prior to trying for the Security+ is a great idea for it really sets the stage for the Security+. On the other hand, two years of networking experience in network security is not going to be necessary for everyone, though for some of you a security background and then some may in fact be necessary. It really depends on your level of experience, for even if you have two years of background experience, your skill level is going to be different than another person with two years of experience. I've been told that as long as you have decent real world experience in networking and the Network+ certification behind your belt that you shouldn't have a problem passing the Security+ with the proper preparation. Like other certifications the Security+ is no different in that you should study, study, and study some more. With the Security+ you should also definitely take as many sample tests as you can for there is a whole lot to remember. From my own certification experiences I found sample tests were the key to my success. Overall the Security+ Certification is one of the best computer certifications for it prepares you for a highly in demand technology field. Companies are going to be hiring network security specialists well into the feature to protect their valuable information. The Server+ Certification from CompTIA is one of the best computer certifications to kick start a career in server support, and the Server+ is a great complement for both the A+ Certification and Network+ Certification. Server+ is well suited to system administrators for once you’ve attained your Server+ Certification it certifies that you have the technical knowledge and skills required to build, maintain, troubleshoot and support server hardware and software technologies. Server+ is actually a mid-level certification that covers advanced computing concepts so it is aimed at individuals who have approximately 18-24 months of experience working in or around a server environment. CompTIA recommends you get the A+ certification before tackling the Server+ certification. The A+ really sets the stage for the Server+ and other certifications but if you already have real world computer experience under your belt the A+ isn’t necessary for you to pass the Security+. On the other hand I think obtaining the A+ and Network+ in addition to the Server+ certification is an exceptional way to prove your versed computer knowledge to potential employers. All three certifications together are a great foundation for a solid career as an Information Technology specialist. Eventually you could work on the Microsoft MCSA which is a great next step on the career ladder. In fact, the Server+ and A+ certifications together can be used as an elective for the Microsoft MCSA certification. To obtain the Server+ you will have to pass one conventional format exam that covers server issues such as installation, configuration, upgrading, maintenance, troubleshooting, and disaster recovery. Before you take the Server+ exam make sure you are competent in these areas or you are going to be in over your head. Like other CompTIA certifications make sure you get yourself a good book or two and take as many sample tests as you can. Many Server+ books come with free sample tests and there are a slew of free sample tests online too. I can’t stress enough how valuable taking sample tests is for passing any of the top 5 best computer certifications. Overall the CompTIA Server+ certification is one of the best computer certifications for individuals interested in entry-level server administration. The Server+ is also a solid gateway to the Microsoft Certified Systems Administrator (MCSA) certification. Server+ is however a mid-level certification so you should already have some experience working in or around a server environment before attempting the certification. 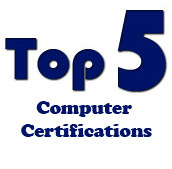 We hope you've enjoyed our guide on the top 5 best computer certifications. If you have questions or feedback for us please Ask The Computer Tech.